Maugein There is 1 product. 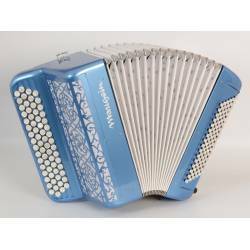 The Amusette 96 model from Maugein has set a world standard for musette accordions.The Amusette is a compact model capable of producing an explosive sound. New models are fitted with handmade reeds and boast exceptional dynamics. A unique finish endows each Amusette with a look of its own.Pictures : Model in stock - Comes with shoulder straps and case.